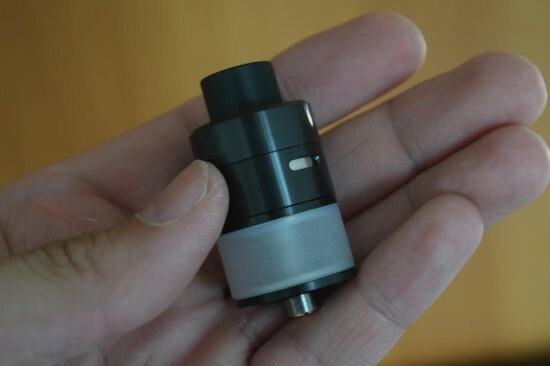 Geek Vape advertises its new Avocado 24 tank as an RDTA, but to anyone that’s not a total newbie when it comes to vaping, this thing is a Genesis-style atomizer. 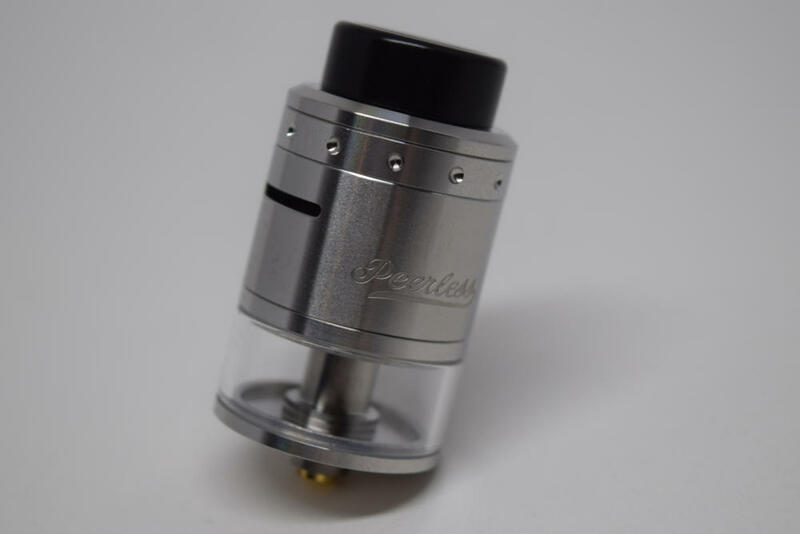 That makes it a blast from the past, because while ‘Gennys’ were quite popular at one point with vapers looking for a compromise between drippers and tanks, they kind of faded away once Rebuildable Tank Atomizers (RTAs) burst onto the scene. 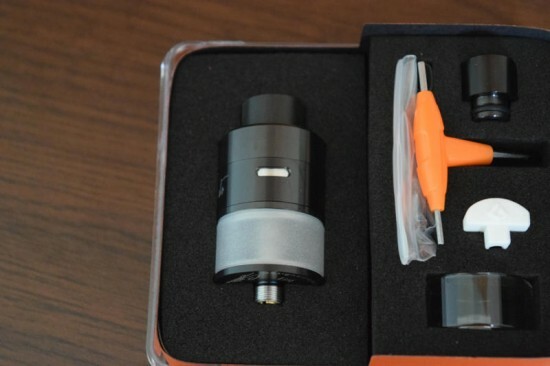 But Geek Vape seems to think Genesis atomizers can still be relevant today, and judging by the huge popularity of the Avocado 24, it might just be right. 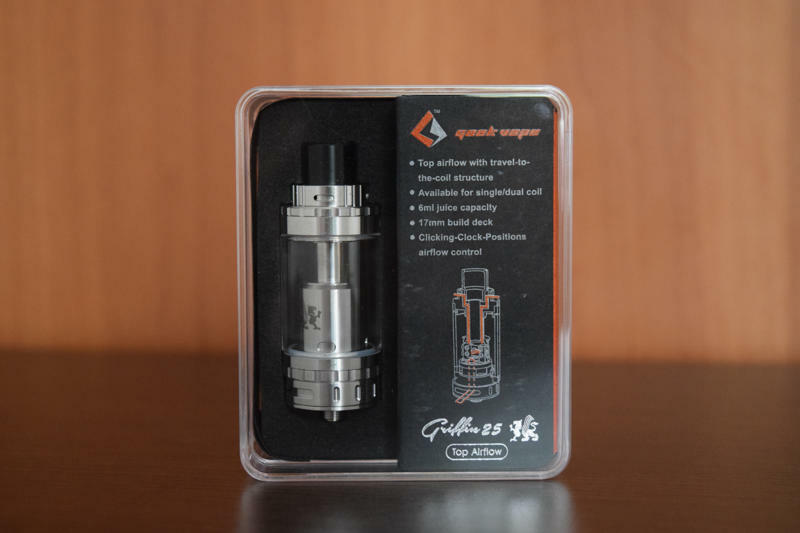 The Avocado 24 comes in the same style packaging we’ve seen on the Griffin 25 RTA – a clear plastic box with a foam holder for the tank and a hidden side compartment containing various goodies: a handy multi-tool, spare glass tank and ceramic plug (for single coil vaping), a stainless steel 510 drip tip and a bag full of O-rings, spare grub screws and an adapter for the 510 drip tip. It’s a nice package, but just like the Griffin 25 kit, it doesn’t come with a user manual. It might not sound like a big deal, but this is a pretty complex device that requires a bit of knowledge to set up properly, so a few basic instructions would have been welcome. Considering even the simple RTAs like the Wotofo Serpent Mini come with a handy instructions leaflet, I just don’t get why Geek Vape refuses to add one with its products. As its name suggests, the Avocado 24 is 24mm in diameter, so unless you’re fine with a bit of overhang, you might want to use it with bulkier mods like the new SMOK H-Priv or the Joyetech Cuboid. The guys at Heaven Gifts sent me the black version for this review, and it looks absolutely stunning on both the aforementioned devices (also black), but Geek Vape also has it available in stainless steel if you like the metallic look more. Whatever variant you opt for, I think you’ll agree that the Avocado 24 is quite the looker, and due to the scarcity of Genesis-style atomizers these days, it’s bound to draw the attention of your vaper friends. From the top of the drip tip all the way to the base, the Avocado 24 measures 43mm, so longer that your standard RDA, but shorter than large tank systems like the SMOK TFV4 or UD Simba. The design itself is minimalist, with the laser-etched Avocado logo being the only thing that stands out. In true Genesis fashion, you have the RDA section on top and the tank sitting underneath. 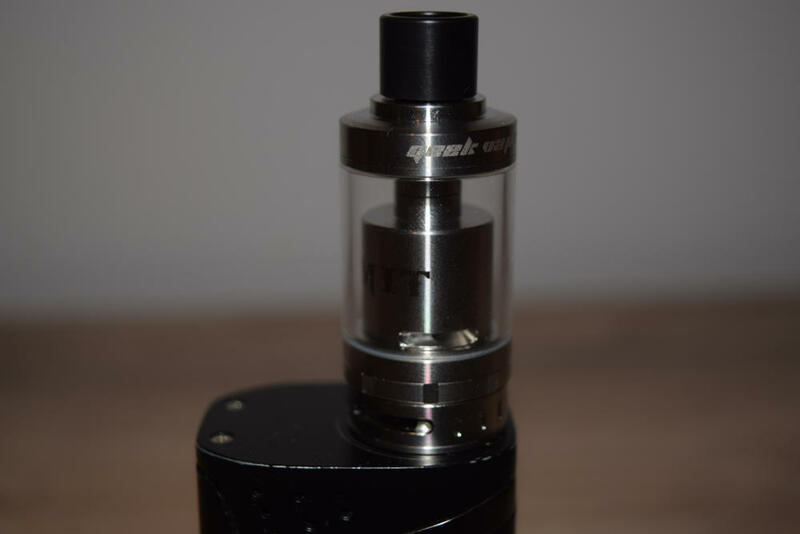 The Avocado 24 comes with a pre-installed with a frosted glass tube which I think adds to its visual appeal, but you can swap it with the spare clear glass tube included in the kit, although you’ll have to take the tank apart to do that. The Avocado 24 comes with a wide bore delrin drip tip that made an already airy vape even airier, so I swapped it for the 510 one. You can do that by unscrewing the threaded wide bore, screwing on the included 510 adapter and just plugging in the metallic 510 drip tip. I’ve read quite a lot of complaints about the Avocado 24’s adapter being way too tight and making almost impossible to detach the drip tip once it’s inserted, but I have had absolutely no issues with mine. I just gently pull on it and it comes off very easily. So I for one consider having the option of swapping various size drip tips a plus. 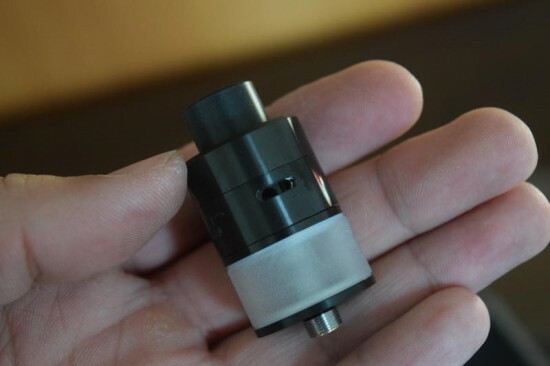 The top section and airflow control ring of the atomizer look detachable from the outside, but are actually press fit together and will not come apart. Speaking of airflow, the Avocado 24 offers a few options that you can choose from by rotating the airflow ring: you have two large 7mm slots (one on each side), two 3mm holes (one on each side), or a single 3mm hole for single coil vaping). I personally preferred the largest slots, wide open. Taking off the top part of the Avocado 24 reveals a beautiful, large Velocity-style build deck that’s simply a joy to work with. The post holes are humongous, so you can use whatever type of wire you want and you won’t have any trouble fitting either the leads or the coils themselves on the deck. You’ll notice the deck itself features four large diameter holes that lead into the tank below, and as you’ve probably already guessed, that’s where the end your wick will go into. 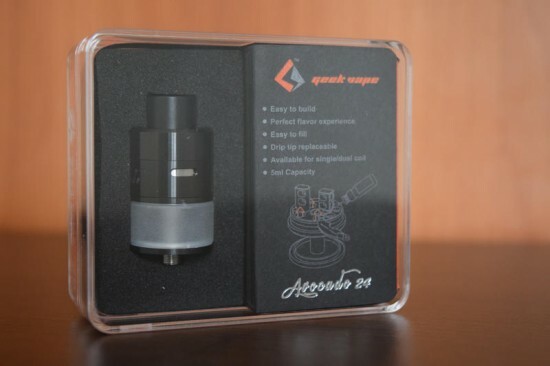 The Geek Vape Avocado 24 can be used in both single coil and dual coil mode, and comes with a pre-installed ceramic plug on one side of the deck. If you happen to somehow lose it, there’s a spare included in the kit. 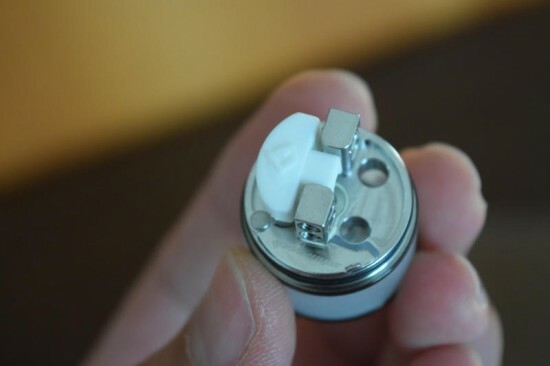 A closer inspection of these plugs reveals tiny O-rings on the legs that go into the wicking holes, which keep them from coming loose, and a small hole that goes right through the plugs. When vaping in single coil mode, that little hole allows air to come through the plug and hit the backside of the coil. So you have air coming in through both the front and back of the coil, which is supposed to improve vapor production and enhance flavor. Perhaps the greatest improvement of the Avocado 24 over the original Avocado is the addition of fill ports. On one side of the Velocity-style deck, you’ll notice a small latch with the “Geek Vape” name etched on it. 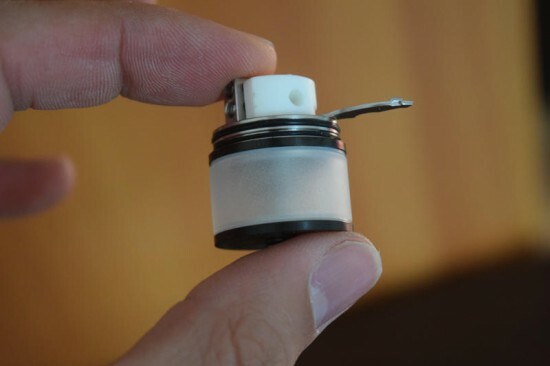 Just pull on the little metal nob and it will open to reveal two fairly large filling holes – one for your dropper of needle bottle and one for the air to come out in case you’re running it in dual coil mode and all four wicking holes are stuffed with cotton. Once you’re done, just close the latch and you’re all set. It’s hard to imagine why Geek Vape didn’t think of adding this useful feature on their original 22mm Avocado, but it’s nice to have it on this newer version. Geek Vape advertises the Avocado 24 as having a 5ml e-liquid capacity, but for some reason, I can’t seem to fill my tank with more than 4ml, so unless mine is somehow smaller than the rest, I think it was an error on their part. But 4ml is decent, so I’m definitely not going to count that as a con. I quite like my frosted glass tank actually, and wouldn’t dream of swapping it for the extra clear glass one. 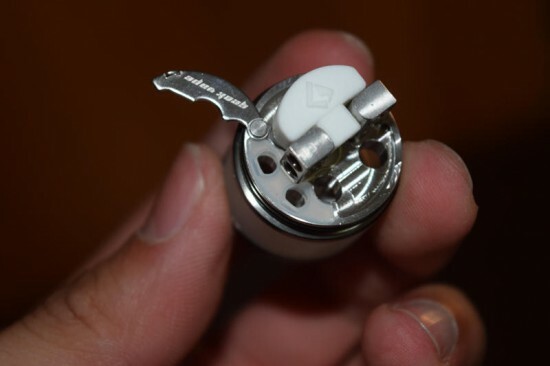 If you would like to do that, though, keep in mind that you have to unscrew the connection pin on the bottom of the atomizer, and a longer screw on the inside, which will cause the positive post of the deck to come off, along with all the tiny peek insulators (make sure you don’t lose those). Putting the tank back together after swapping the glass tubes could prove a daunting task for casual vapers, so unless you know what you’re doing, I suggest sticking with the frosted tank. It’s the better looking one, anyway. 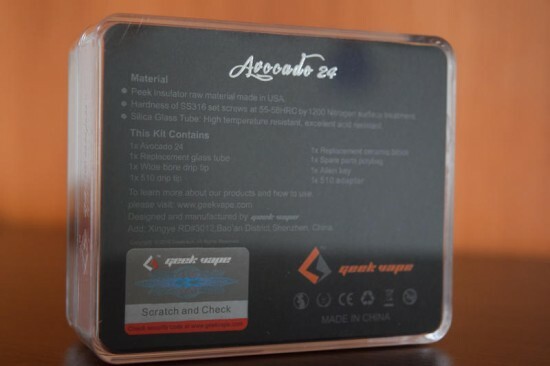 Now for the nitty gritty – how does the Geek Vape Avocado 24 perform? The answer is “fantastic” IF it’s set up properly, and “utterly disappointing” if it’s not. If you’ve ever used a Genesis-style atomizer before, you probably know that the key to optimal performance is the wicking. 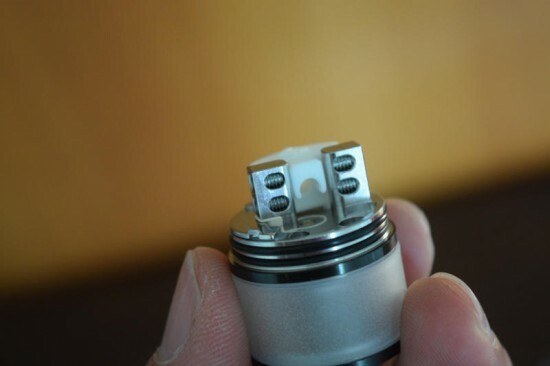 Using the Avocado 24 seems easy enough, secure your coils in the Velocity posts, grab one or two strands of cotton, fit them through the coils and stuff the ends into the tank through the large wick slots. If the stars align, you might actually get it right, but unless you have experience with this type of system, there’s a high chance you’ll screw up and probably blame it all on the atomizer, as well. 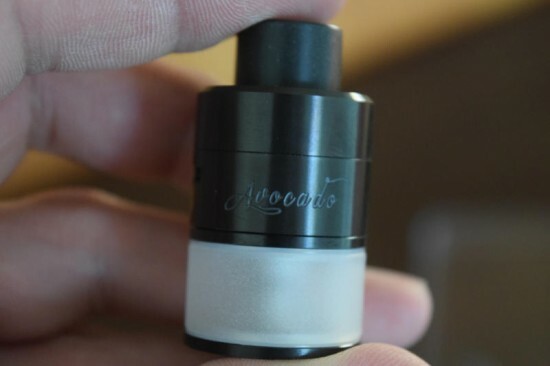 Without a user manual, there’s no way of knowing that longer cotton strands that reach all the way to the bottom of the Avocado 24 tank wick worse than shorter ones that reach about halfway through the tank, and also decrease the intensity of the flavor. Most new Genesis users will also be oblivious to the fact that making the cotton wick too thick and fluffy will make it harder too soak up juice and likely lead to nasty dry hits, especially when chain vaping. You want to make sure the cotton has a bit of wiggling room in the wicking slots, thus making it easier to saturate with e-liquid. Also, a nice trick that could have been included in a user manual is that when vaping in single coil mode, you can tilt the Avocado 24 to help the cotton soak up juice more efficiently. I really, REALLY think Geek Vape should have included some instructions instead of simply relying on the intuition of its customers. Once you get the hang of it, the Avocado 24 is an amazing atomizer! So far, I’ve only been using it in single coil mode, with an 0.5Ω quad-twisted wire coil. I was going to move on to a dual-coil setup, but i decided to pass after seeing ho thirsty this thing can be. Genesis atomizers in general tend to burn through juice quite rapidly, and the Avocado 24 is no exception. So for the sake of my e-liquid reserves, I’m going to stick to just one coil. But even so, the amount of vapor and rich flavor you get from this thing are phenomenal. It’s on par with a dripper, minus the hassle of constantly having to saturate the cotton. But you can also use like that if you want, or if you find wicking it too much of a hassle. You can drip directly on the coils and cotton, and the excess juice will just end up in the tank. It’s not the way it was designed to be used, but it works. 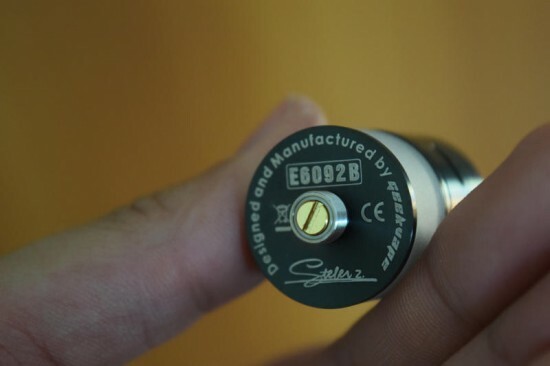 I’ve had no leaking issues so far, which is kind of weird to me, since Genesis-style atomizers are notoriously prone to leaking issues by design. But I’ve accidentally had mine fall sideways and even stored it improperly a number of times and I’ve experienced no serious leaks. I’m pretty sure that if you use it properly, this thing will not leak. If you haven’t used Genesis atomizers before, the Geek Vape Avocado 24 might take a while to get used to and set up properly, but it’s totally worth the extra hassle. If you’re looking for a convenient way to experience RDA level flavor and vapor production in a more convenient way, this device is the perfect choice. Vapor DNA carries the Avocado 24 for $36.99, so if you’ve been wanting to try out a good Genny, go ahead and pick it up, you won’t regret it!